Hello! Very glad to see you make it to this page to find out about the HELMS Proposal for storing nuclear waste around the country in a sensible way. First, let's agree on one thing. There is no really great way to deal with this waste. The nuclear industry created it, and they have really no good way to deal with it. With that said, there are some really bad ways to deal with it and some much better ways. We have to balance all the issues and promote a positive plan that will be as prudent as we can be, without relying on some future magic. As I frequently say, the favorite five words of the nuclear industry are "We'll figure it out later." The trouble is that it is later, now 20 years after they were supposed to first take the fuel, and it is sitting all around the country. HELMS is a plan to figure this out now, for the good of future generations, we must have a good plan that won't just start failing in a few decades with no backup plan. I hope you will take the time to read the HELMS document and the NRC filing (below) so you know what we are asking for. Continue to help by spreading the word! See Helms Campaign for specific instructions. Hardened - Robust facilities that will resist simple surface attacks. Extended-life - double-wall design of canisters to provide easy detection of cracks using pressure loss detection and sacrificial outer cask to resist corrosion. Local - Move waste from precious water resources but not all the way across the country, to probably a dozen regional consolidated sites. Monitored - Standard 7/24 electronic monitoring of critical parameters: temperature, radiation flux, airflow, etc. Surface - Forget the deep geologic repository for probably the next 200 years so this waste can cool off. 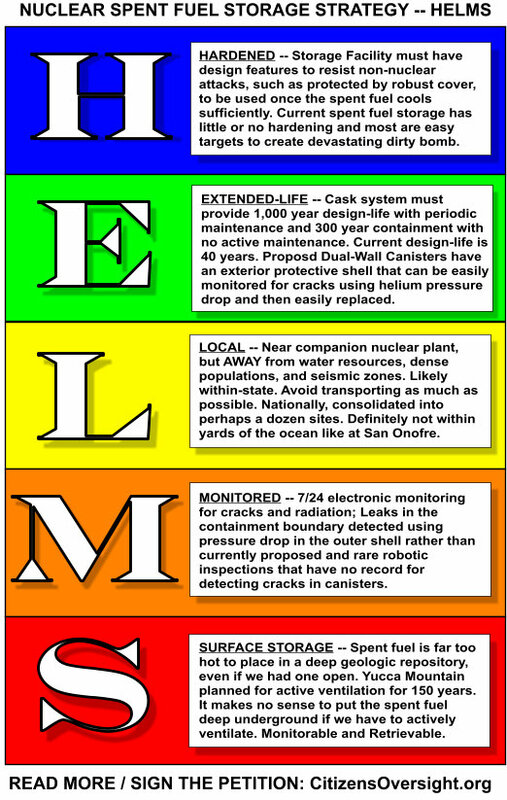 Regarding nuclear waste, we view the likely near-term solution to be storage on or near the surface, in containers that can be easily and passively cooled, and which can be configured for long-term storage of up to 1000 years without any need to move the containers from that location, and which can be protected so as to be immune from terrorist attack. At this point, we are seeking members of the public, researchers from academia, etc. to step forward to form a team which will determine design goals and accept various design ideas. The overall paradigm of the project in a particular vision of the future will be established on this topic page as it is enhanced. This is an active project which will be enhanced as new facts come to light, new ideas are put forward, and as the team performs its work. To be published in the Federal Register on March 22; Public comments will be accepted for 75 days. This version was distributed to the San Onofre Community Engagement Panel (CEP) at the Nov 2, 2017 Meeting. The Colors: Purple means the ISFSI (independent spent fuel storage installation) is not within the isolation area of the plant, or is constructed separately. Some were licensed but have no fuel in them yet. The green ones are right next to a power plant. Interestingly, Diablo Canyon constructed their ISFSI up the hill quite a ways from the plant and pretty far from the water, relatively speaking, so it is purple. 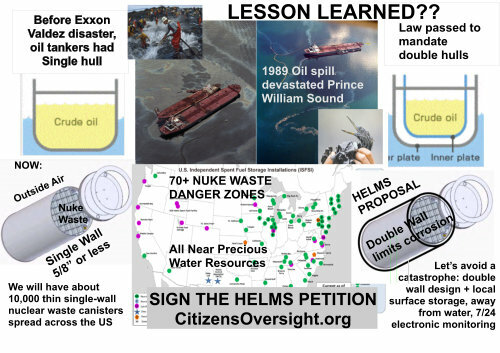 Please sign the HelmsPetition to support the Helms Proposal and to stop the use of thin, single-layer canisters for storing nuclear waste. Have we not learned anything from the Exxon-Valdez disaster? Project Description Proposal realistic plan for safer nuclear waste storage on the surface using extended-life over casks.